The Perdulla’s welcome your family this holiday season from November 16 thru December 21, 2018 (closed Thanksgiving Day). Searching for the perfect tree is an easy task with 35 acres of fir, spruce, and pine trees. 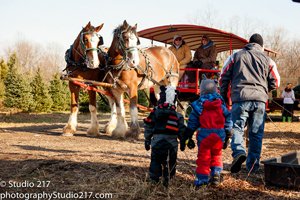 Horse drawn wagon rides are available on three weekends: November 23, 24, 25 and December 1, 2, & 8, 9. We provide saws and sleds. Just remember to bring the whole family. Pets are always welcome! Our friendly staff will help make your tree picking adventure enjoyable. All cut-your-own trees are $62 (includes sales tax). Precut fir, spruce and pine from 3-10 ft. are available in our barn. Wreaths, pine roping, table-top trees, and potted trees are available. Check out our website or Facebook page for coupons. We welcome families and friends to embark on the age-old quest of finding the perfect farm fresh Christmas tree in Poland, Ohio!